SHAMPOO Stains are pre-treated. 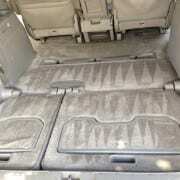 The carpet, mats and seats are steam cleaned or shampooed, scrubbed and extracted as necessary. WINDOWS The interior windows are cleaned and polished streak free. *Extra fee for excessively dirty vehicles, pet hair, pet mess, vomit, mold/mildew, rotten food, gasoline or paint spill, etc. Please let us know if your vehicle has an issue such as these so we can make sure to schedule enough time and be properly prepared to remedy the issue.